"You thought I was gone but I wasn’t. I think it's hilarious. The lighting looks to me to be from a flashlight, as if someone heard a noise in the middle of the night and came to inspect. With that in mind, I don't mind the blow out highlights but instead think they add to the picture. Anyway, the bear, after all, is perfectly exposed. Cute idea, but too fuzzy - image-wise that is, too bad, as the idea has a lot of promise. It looks like this little guy is trying to climb out of the garbage. Cute idea - clever. Unfortunately the flash and highlights are a bit overblown for my tastes and detract from your desired effect. You should also care about technical performance of your photos. We should do our best to make viewers enjoy our work, not only fit the challenge. Is that snuggles? I like the spot lighting. Good luck. Cute idea, its to bad you didn't show more of the bear, but I still like it. this photo is a bit bizarre and out of focus. but i still like it -- a bit like a horror flick. not sure why it's all streaked vertically, but an interesting idea. Sory, I don't get this one. It is too contrasty to see very clearly. 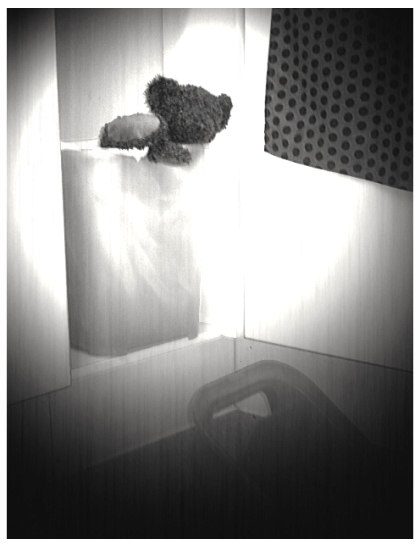 You can't see anything except for the teddy bear, it would be better if I could. Suffed animal, soft focus, glare, bad exposure. I don't know what I'm seeing. Proudly hosted by Sargasso Networks. Current Server Time: 04/23/2019 01:54:59 AM EDT.